It is possible to produce a garden without store bought tools. You could use a stick to dig I suppose. I’m guessing the majority of us do not do this. Having the proper tool makes our garden toils less…toilsome. Proper care of our tools can keep us from having to replace them. I live on a budget. At times, that budget is confining. When I have money to spend in the garden, I like to buy seeds, or plants or trees. I don’t want to have to replace a hoe, or put a new handle on a spade. However, as a so called adult, I realize that this is what needs to be done, so I do it. One of my favorite Podcasts is Stuff You Missed History Class. I thought it might be enjoyable use this format to talk about stuff in Botany that will help gardeners. With everyone getting their seed packets out, I think it’s a good time to talk about germination. Learning about seeds can help you increase your germination rates, helping you get more plants to yield each year. We all want that, right? For the most part, a seed is very much like a chicken egg. They have a shell, or seed coat, an embryo that is a baby plant, and a food source, called cotyledons. Root, Root, Roots and All! My brother in law, Roger, used to have a rather large vegetable garden. After a career change, he moved to a city house that did not have the yard for a garden. Recently I asked him what he missed about growing his own veg. His response puzzled me at first. He said, “I miss being able to eat stuff straight from the ground.” Again I was a little confused. Isn’t all vegetable matter straight from the ground? After a little ferreting out, I realized what he meant. He misses the root crops. He grew beets, turnips, radish, and carrots primarily. He had the obligatory tomatoes and peppers, but his passion was the roots. Being a southern boy, he also loves greens. The things he had in his garden with the exception of the carrots make nice greens as well. I must admit, I am only slowly coming around to the root family. My family doesn’t enjoy cooked greens. Until last year, I had only planted carrots and parsnips. This year I have branched out considerably. This is due mostly to the amount of gardening space we are now allocated. In times past I would have had to have sacrificed something my family loved for something they only tolerated. However, with the new house came new space. Space to stretch my gardening legs. This year I am growing turnips, “Red Top Ideal”, beets, “Chioggia”, and radish, “Spanish Black”, “Philadelphia White”, and “French Breakfast”. These are along with my regular crops of carrots and parsnips. Root crops are pretty happy crops as a general rule. They really are not fussy or demanding. They like light, well drained soil and they like to be fed pretty frequently. Radish likes a cool head and will spice up on you considerably if it’s too warm. It’s important to make sure you don’t have and rocks or clay clots in your bed. As the root is going down, when they encounter an object, a rock, a clot, a root from a tree, they will either bend around the object, or split and continue growing. This doesn’t change the nutritional value in the least, but it does make for odd shaped harvests. It also makes your plant work a little harder which can lessen your yield a bit. Again, you can eat these, but they are not ideal and can be avoided with a little prudence ahead of planting. Phat Tuesday! pH Levels. Oy Vey! pH levels and what to do about them. I am not a scientist. I do not play one on TV. However, my degree was in Library Science, which has enabled me to find out some of what scientists know. Unfortunately, some of the information I was able to find seemed to be written in a foreign language of which I am not familiar. I speak Geek, but I wouldn’t say I was fluent in it. Here’s what I was able to distill about pH levels. pH levels are a measure of the acidity (sourness) and alkalinity (sweetness) of soil. A numerical scale is used to express the pH level. The scale goes from 0.0 to 14.0, with 0.0 being most acid and 14.0 being most alkaline. 7.0 is considered neutral. It seems that pH levels are not a measure of soil fertility, but instead is an indication of the availability of access to the the nutrients. For instance, soil may contain adequate nutrients and yet plants may not be able to access those nutrients because of an unfavorable pH level. What does that mean for gardeners? I think of it this way. I have four kids, they have four different values of nutritional needs in order to function properly. However, all four have different tastes and preferences. In order to make sure they get what they need, it may be necessary to make it palatable for them. For example, all four need vitamin C. I could put out four glasses of orange juice for them to drink. But if Ryan doesn’t like orange juice, he won’t drink it. Meghan is on a diet so she leaves hers as well. Jonathan doesn’t like the pulp so his goes untouched. Patrick loves orange juice and drinks all four. Three of them did not benefit from the available juice or receive the vitamin C they needed. One of them is going to need the restroom in about 20 minutes. Ryan loves hot and spicy anything and loves vegetables. I give him a salad with jalapenos and sweet red peppers and tomatoes. Vitamin C delivered. Meghan is on a diet. I give her half a grapefruit. Vitamin C delivered. Aubergine, eggplant, melongene, brinjal, or guinea squash, call them what you will, just make sure I have plenty in the garden. Confession time, until very recently, five years ago, I was not an eggplant fan. You see there had been an eggplant “incident”. I, in all my wisdom, at the tender age of 15, you know, when you still know everything, decided I would cook for our family. Maria made the same thing every week. You could construct a calendar by her. Monday meatloaf, Tuesday lamb, Wednesday chicken, etc. So after some considerable buttering up of my Grampa Wilson, I made my pitch. I laid it on thick, Maria had enough work to do, I could use more responsibilities, we really needed more nutritional meals. You name it, I used it. And…it worked! Well sort of, he gave me Thursday. Thursday was to be my night, all me, oh forever more, what had I done? Of course, Grampa Wilson had seen through the buttering up, and trumped me with ease. Maria and Carlos stayed for supper every night but Grampa said that on Thursdays, their whole family would be coming. Supper for ten every Thursday night. Glub…glub…I’m drowning here! So, I did what I always do when I find myself in a conundrum. I hit the library and every local book store. I came home with scads of books. Over the next week I came up with a one month plan for Thursday night meals. Week one went without a hitch. 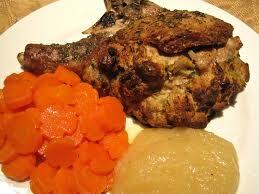 We had stuffed pork chops, baby carrots, salad with homemade vinaigrette and apple pie for dessert. Easy peasy. Well sort of, it’s really hard cooking for that many people. Now as I’ve already said, I was 15 and I did know everything. Week two is Ratatouille. So easy a rat could make a whole restaurant with it, right? Yes, well there seems to be a little more to it than that. What turned out of that kitchen was so beautiful, it was a kaleidoscope of colors with the eggplant, the tomatoes, bell peppers, mushrooms, Parmesan, garlic…it was beautiful and shiny. Unfortunately, we had to eat it, not take pictures with it. What it was, was bitter. Very bitter. Unbelievably, disgustingly, undeniably bitter. Because it had so many veggies in it, I had not done sides. I had made Rosemary bread and custard for dessert but bread and custard were not going to fill ten hungry bellies. In true Grampa Wilson fashion, he saved my bacon. In 45 minutes he made a London Broil and mashed parsnips that, with the custard and bread took care of things. I thought for sure Thursday cooking duties were over for me, and I must say I was a little relieved, they were overrated. I had done it for two whole weeks and that was about enough. Fast forward 22ish years. I have never attempted eggplant again. By this time I have my own household, a husband, four kids, a huge garden. I come across seeds for white eggplant. White eggplant? Fascinating. I have some room in one corner of the garden, so why not? It ends up, Eggplant, where have you been all these years? 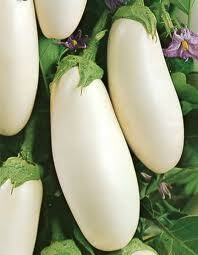 So, if for any reason, you haven’t tried growing eggplant, let me introduce you to a real beauty to tame the beast. Like a tomato and potato in the family of the nightshade. They are natives of India, but are grown everywhere. The particular eggplant I will tell you about today is “Gretel”. “Gretel” is the reason I started to grow and love eggplants. To start with, “Gretel” is white, not purple. “Gretel” is long and skinny, not teardrop at all.